ATLANTA (December 8, 2014) — Chick– fil–A® is launching two new features — mobile payment and mobile ordering — within the Chick–fil–A Mobile App to help guests save time and ensure a convenient and personalized experience. Chick–fil–A restaurants nationwide are now accepting mobile payments through the Chick–fil–A app so that customers can use their smartphones to pay for meals without relying solely on cash or credit cards. 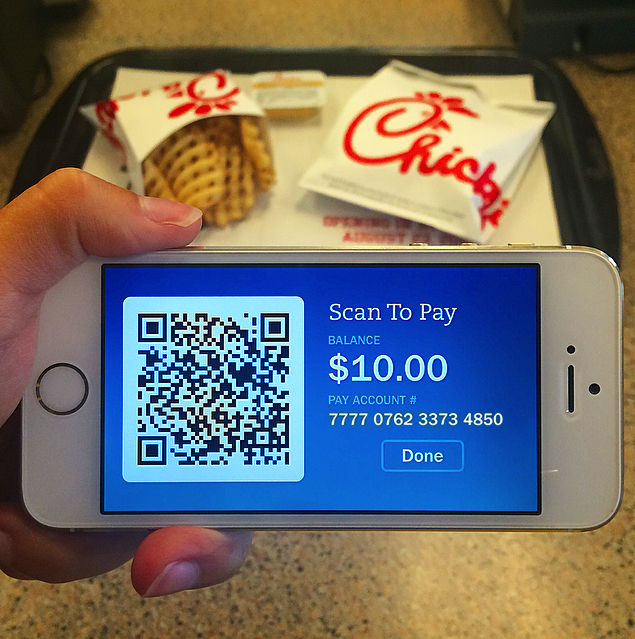 The national rollout in all Chick–fil–A restaurants, with the exception of licensed locations, marks the official launch of the Atlanta–based restaurant chain’s mobile payment system. 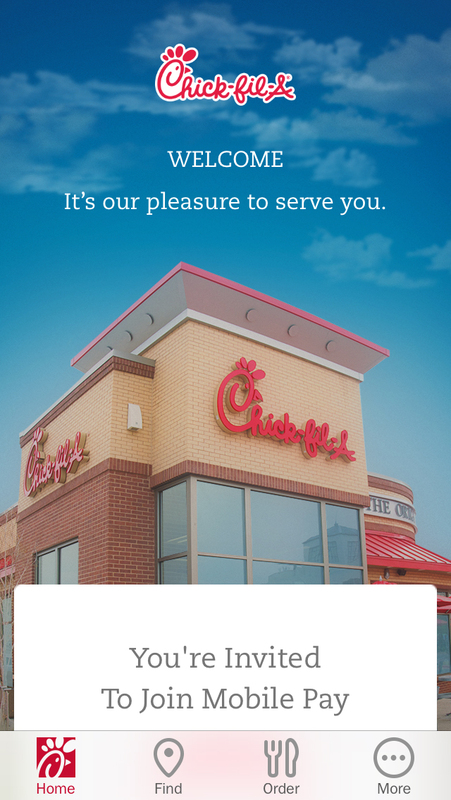 Chick–fil–A customers can download the free app from the App Store for iOS or Google Play for Android devices. Once the app is downloaded, customers can register for an account and load funds onto it using credit or debit card information. When customers are ready to pay, they simply tap the “Pay” button and scan their account’s unique Quick Response Code (QR code) at the register or drive–thru window. The cost of the meal will be automatically deducted from the account balance. Mobile ordering is also now available in more than 130 Chick–fil–A restaurants in Atlanta, Chicago, Houston, Los Angeles, Orlando and Washington, D.C. Customers in these pilot markets can use their smartphones to place an order and pay before they reach the restaurant. During the order process customers can choose any entrée, side item, sauce and beverage they want and can completely customize their order based on their preferences. Favorite orders can be saved for easy reordering in the future. After selecting their pick up method (walk inside the restaurant or have their meals delivered to their car), customers then pay for their mobile order using a credit or debit card or with their Chick–fil–A mobile payment account. The food is prepared when customers “check in” on the app to ensure they receive fresh food quickly and on their schedule. 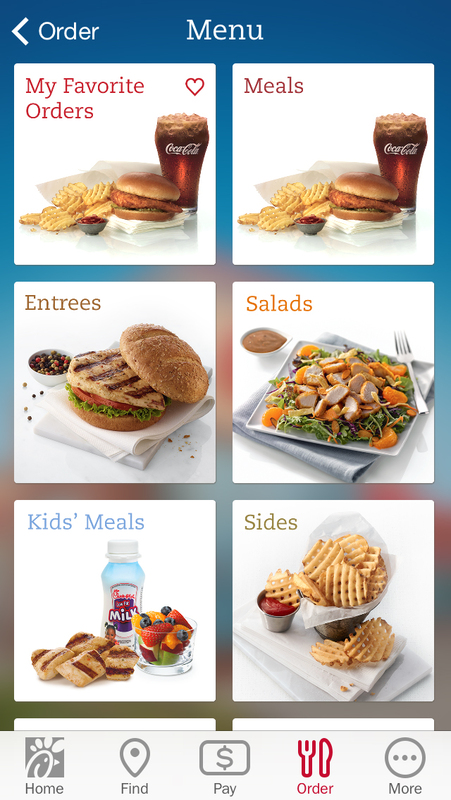 Chick–fil–A’s mobile ordering pilot began in early 2013. It is available on the App Store and is expected to be available on Google Play soon. It is presently not available for breakfast or catering orders. The company will expand mobile ordering to more restaurants in 2015, with mobile ordering available nationwide by the end of 2016. Chick–fil–A is listening to its customers and plans future enhancements to its mobile app experience, including an auto–reload option for mobile payments and the ability to use Apple Pay within the Chick–fil–A app. 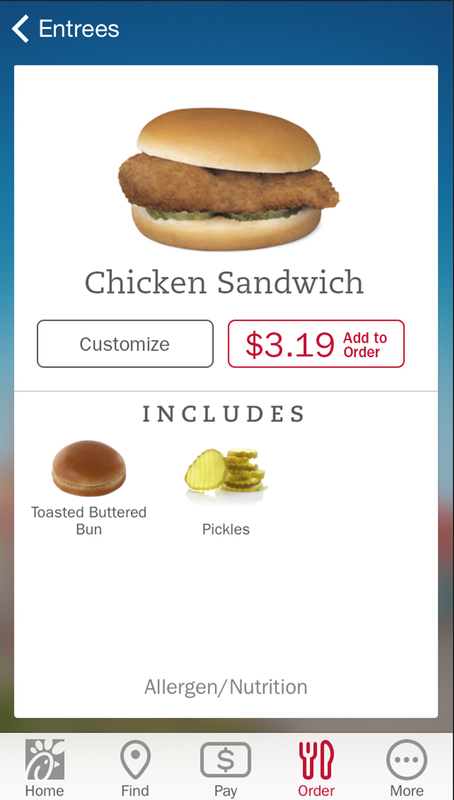 While mobile ordering is currently available in select locations, all Chick–fil–A customers have access to other features on the Chick–fil–A Mobile App, including menu and nutrition information, an allergen filter, restaurant location finder and more. About Chick-fil-A, Inc. Atlanta–based Chick–fil–A, Inc. is a family owned and privately held restaurant company dedicated to serving the communities in which its restaurants operate. Known for its original chicken sandwich, Chick–fil–A serves freshly prepared food in more than 1,850 restaurants in 41 states and Washington, D.C. Founded by S. Truett Cathy in 1967, Chick-fil-A produced sales of $5 billion in 2013. Chick-fil-A was recognized in 2014 as one of America’s “Top 20 Most Admired Brands” by The Harris Poll, “Top Fast Food Chicken Chain” by Consumer Reports and the only restaurant named to 24/7 Wall St. “Customer Service Hall of Fame.” More information on Chick–fil–A is available on the chain’s website, located at www.chick-fil-a.com.